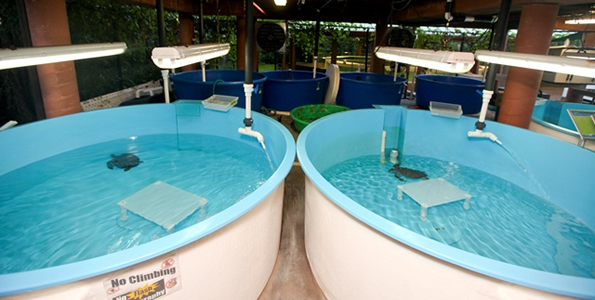 Our Sea Turtle Rehabilitation Facility was opened on January 1, 2010. For the past two decades, our turtle conservation program has rescued sick and injured sea turtles throughout south Palm Beach County. However, we have always sent turtles to other facilities to be treated. After being licensed by the Florida Fish and Wildlife Conservation Commission on January 1st, a cold snap hit Florida stranding nearly 5000 endangered green sea turtles. 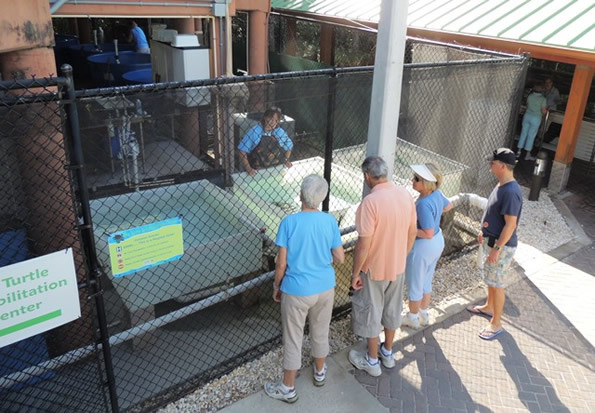 Gumbo Limbo treated and released more than 177 of those turtles. In addition to treating these turtles for cold stun, 35 of those turtles also had surgery to remove noncancerous tumors from their eyes and flippers. These tumors are caused by a disease called fibropapillomatosis. Fibropapillomatosis is thought to have a strong correlation to polluted waters. Visit to learn about the turtles under our care, find out how and why they got here, and what you can do to help! 24 Hour Sea Turtle Rescue Line at: (561) 212-8691. If you ever encounter an injured sea turtle or other injured wildlife please contact Florida Fish and Wildlife Conservation Commission’s (FWC) Wildlife Hotline immediately at: 1-888-404-FWCC (3922). You may also dial *FWC or #FWC on your mobile phone.